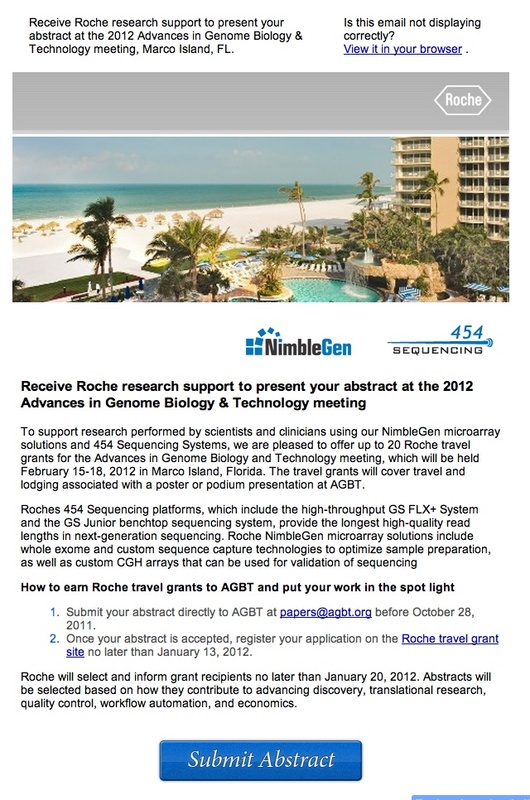 Just got this email from Roche announcing a grant program to pay registration and travel fees for the AGBT meeting if you are using Roche-454 sequencing or Roche-Nimblegen arrays as part of your work (see below). Seems like this would have some of the same conflict of interest issues as a pharma company paying someone to give a talk. I note – I participated in a session supported by 454 at a meeting but paid my own way to avoid this type of conflict of interest issue. Anyone have opinions on this? Is this a common pharma method creeping its way more and more into genomics? Interesting post – I hadn't considered being sponsored by the makers of a piece of equipment you use to be much of a conflict of interest (although admittedly I am newish to the world of scientific conferences). I can see it being a problem if your abstract is basically “Roche equipment is amazing” but do you think it is also a problem if the abstract is “using roche equipment we found…” ? If you did receive the grant isn't it normal practice to write this on your poster/say it in your presentation? That would point out any possible conflict of interest to your audience. Or do you think that is not enough?